My favorite fair is back*! And this year, we may have the perfect weather to enjoy the program. If you're a newbie, Seoul Friendship Fair proposes a week end of performances from foreign troops (dance, music) around City Hall and Mugyo-dong, but I confess I mostly come for the food, another festival from all horizons. After all, cuisine should be considered a major performing art, shouldn't it? The full program for this edition (May 5-6) is on the website seoulfriendshipfair.org, along with, this year, food recipes from all over the world. Great initiative... even if the recipes are only available in Korean. Fair enough: I should read Korean, shouldn't I? 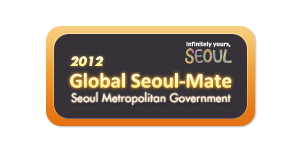 By the way: I've just been officially appointed a Global Seoul-Mate thanks to you, Dear Readers, who've been visiting from over 220 countries and territories over the past 5 years. The aim of this program is to help global audiences know more about the city, and that happens to be part of the collateral damage caused by this excuse for a blog. Don't worry, Seoul Village will remain totally independent, nonsensical, and poorly written.